I read two articles today about the 1911. One was in Shooting Times by a retired law enforcement officer who has carried a 1911 for 40 years. He said he was going to tell us all the reasons the 1911 was better than any other handgun out there. His first premise was that it was available in multiple calibers. Yeah, like every other semi-automatic handgun is not! Come on. He got so wrapped up in shooting 1911s in every caliber from 22 to 45 that he forgot to tell us all the other reasons it is better. He didn’t come up with a single one. I was hoping for some, because I like my 1911, I really do. The second article was in Concealed Carry Magazine by a 20 year firearms instructor. It wasn’t an article about the 1911, but about how expensive doesn’t necessarily mean better. He mentioned that during his shooting classes the one type of handgun that has the most failures is the 1911. Then he mentioned that the second gun in his handgun classes that has the most failures is the 1911. He just doesn’t experience failures with any other type of gun on a regular basis, but he does with 1911s and the more expensive they are the more they fail to feed or fail to eject. I really enjoyed that article because it reflects the experience we have at Texas Gun Pros. We conduct several Concealed Handgun Classes each month with anywhere from 10 to 20 shooters per class. 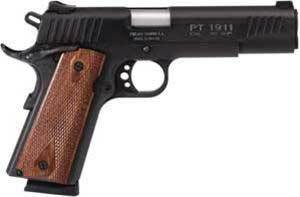 The only guns we see jam or fail to feed or eject are 1911s. On rare occasion we’ll see a new gun of some other model that will fail to feed or eject maybe once, usually because it wasn’t cleaned before firing and has had no break-in period at all. The love affair with the 1911 is blind. Come on, admit it! Boy has my perspective changed since writing this. I discovered the world of 1911s that really work well and really shoot well and darned if I don’t make a 1911 my daily carry gun more often than not. What changed? Learning the gun. Learning what it’s all about and finding I really shoot 1911s well. So fast forward and read some of my later blogs about the 1911 and forgive me for this. Do I still see 1911s jam? Yep, but usually it’s the small ones, or ones that have not been cleaned and maintained properly. Modern marvels, not so much. We have 3 firearms in our family. None of which have had a single FTF, FTE or any other type of malfunction. The firearms are listed below along with their age and round count. I love to customize, but these firearms are untouched for the sake of reliability. All 3 are cleaned meticulously after each use. 1. Glock 17 – 6 months old, 2,000 rounds of FMJ and JHP factory ammo. 3. Kahr PM9, 8 years old, 500 rounds of FMJ from me and unknown from previous owner. I own a 1911 (colt series 80) that I got from my grandfather. I have had it jam (brass not clearing before slide returns) once when I was trying to see how fast I could fire it. Anytime I fire at a measured pace I have no difficulties. Not that big of an issue, don’t fire it like a moron and it doesn’t happen (at least for me). The second and far larger issue is failure to feed. If I use anything but ball ammunition it will regularly fail to feed. So far with about 200 rounds of ball ammunition I have had zero feed problems. With 3 different types of hollow points I have had feed issues at least once per magazine, sometimes every other round. I enjoy shooting mine, it fits my hand well and has a comfortable weight. The design is a hundred years old of course there are going to be better guns out there. Your grandfather’s gun wasn’t designed to feed hollowpoints, though it could probably be made to do so. I’d leave it alone. it’s a part of history and a wonderful gun. Having a gun that’s fun to shoot is different than having one you’d depend on to save your life. Nothing wrong with having both kinds. This YouTube video tells it like it is. And it has really hit a nerve on lots of people. You may not agree with the guy, but he has some valid points. Previous Previous post: The Family That Shoots Together . . .